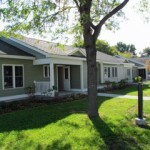 The Vermont State Housing Authority is dedicated to the development and preservation of affordable housing in Vermont. As part of this effort, the organization is actively involved in the acquisition, construction, and rehabilitation of multi-unit complexes and mobile home parks throughout the state of Vermont. VSHA accomplishes this objective through the use of public and private financing including grants, traditional borrowing, tax exempt financing, tax credits and charitable contributions. VSHA staff have a wide background in public and private land planning and development. They also have knowledge of environmental laws, regulations, and permitting. They are directly involved with projects both technically and hands-on from acquisition through project management. VSHA staff perform financial, grant writing and grant management services for an array of funding programs. If you wish to further pursue housing development opportunities please, feel free to contact us at (802) 828-3026. A good checklist from the New Hampshire Community Loan Fund can be found here to help get manufactured homes ready for winter.